On Sunday morning, January 8th, the GLCM crew was able to soak up the last bit of our stay at the Marina Bay Sands. Some students chose to go to the infinity pool one last time, while others made sure to get a head start on the day with a quality breakfast first (Some of us even made it to both!). After checkout, we headed for the other side of the Bay to kickstart our walking tour of the Civic District. 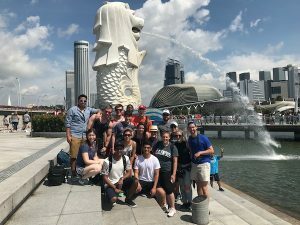 The tour of the Civic District began at Merlion Park; this park sits directly across the bay from the Marina Bay Sands resort and offers a great view of the hotel as well. It is called “Merlion Park” because it houses two real statues of the merlion, which is the Singaporean landmark. At the park we visited, there is a large, ‘Mother’ statue at the edge of the bay and a smaller ‘child’ statue closer inland. The merlion is a mythical creature with the head of a lion and the body of a fish. 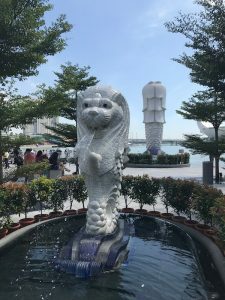 The merlion was chosen to represent the blend between the country’s legend of being “the lion city” as well as its history of being a fishing village. The word Singapore comes from the Sanskrit word Singapura which literally means “lion city”. A lion was spotted on land from a ship which is thought to be a good omen, therefore, the land was chosen to settle on. The merlion sits at the edge of the water to commemorate this belief. From there, we went to see the Armenian Church. This building was the first church in Singapore to have electricity, and is the oldest Christian church in the country. The British government awarded this land to the Armenian community. Many contributions were made by Armenian communities in other countries such as India, China and Indonesia to help with the construction. 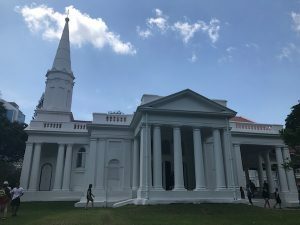 The Armenian community in Singapore asked for the land in 1833 and the construction of the church was completed in 1835. The priesthood of the church was active until the 1930s. Our next stop should have been St. Andrew’s Cathedral, but there was a mass in service that made us unable to go inside. Instead, we continued onward towards the CHIJMES. The CHIJMES used to harbor a middle education school, an orphanage, and a church, and is now a multipurpose center with shops and restaurants. 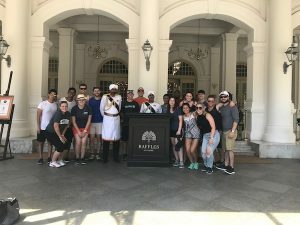 We ended our walking tour at Raffles Hotel, which is named after Sir Thomas Raffles, the founder of Singapore. In search of a new port city, Sir Raffles came upon the shores of Singapore, which at the time already had other ports established by the Dutch and the Portuguese, as well as an established Dutch colony. Sir Raffles boldly took claim of the land by emploring the enactment of a treaty releasing trade restrictions. Much of the tensions surrounding Singpaore at the time were mediated shortly after the treaty was enacted. Many establishments have since been named after Sir Raffles, including the Raffles Hotel. The hotel is a gorgeous three-storey building that locals and travelers alike would agree to be a must-see. The rates for a one night stay start at $1200 Singaporean Dollars, which is about $830 USD. If there were more time in our trip, we all really would have loved to have been able to stay at this hotel (but the Marina Bay Sands will have to do this time). For lunch, we went to the East Coast Hawker Center. Hawker centers describe places where there are a lot of street vendors in one location. After lunch, the group split up; some students rented kayaks in the main harbor while the rest returned to the hotel to nap – both a perfect capstone to an exciting, activity-packed weekend! In regards to Kampong Glam, a change in itinerary allowed us to be able to visit that neighborhood earlier in our trip. In Kampong Glam were able to eat dinner at a traditional Malay house where we enjoyed traditional Malaysian cuisine as well. We walked through the neighborhood and got to visit the Sultan’s Masque.